Every couple of years, progressives are faced with the terrifying possibility that we might actually win. I didn’t live in San Francisco when Matt Gonzalez almost won his race for Mayor, but I know that across the country good lefties indulged in a guilty game of “what if.” What if we actually had the opportunity to lead? For Gonzalez, the help came too little, too late. He fell just short, and the race begged the question: If the next opportunity was right in our own backyard, would we know it soon enough to make a difference? Welcome to October 2006, where that opportunity is here: It’s the District Two race for City Council in Oakland, where Aimee Allison is two weeks away from pulling a stunning upset that would turn the political establishment on its head. 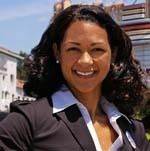 Simply put, Aimee Allison’s campaign for City Council is the single most important race in the Bay Area this year. It may also be the area’s best-kept secret, but with two weeks to go progressives are taking notice of this upstart campaign that could transform Bay Area politics. First, a quick primer on Oakland politics: In a sentence, its developers vs. everyone else. Eight years ago, Jerry Brown, the Governor who wanted to be President and is about to be Attorney General was elected Mayor of Oakland. This upset people who actually lived in Oakland, like Ignacio de la Fuente, the City Council President. Still, De La Fuente and Brown, along with a majority of City Council, formed an unholy alliance that for 8 years has welcomed any developer to town, no questions asked. Development in Oakland is unhinged from any real strategy, and it has done little to lift struggling communities out of poverty. The 2006 Mayoral race looked to be a coronation for Ignacio, who initially was opposed only by Councilmember Nancy Nadel, a wonkish anti-hero with deep convictions. Then last October a coalition drafted former Congressman Ron Dellums into the race. One of the nation’s most diverse towns, Oakland was run for years by a strong black political establishment. Dellums was viewed as someone who could pull together the three-legged stool of Oakland politics (labor, social justice and the black community) into a real governing coalition. He inspired voters with a pledge to make Oakland a “model city,” with universal health care and a commitment to jobs in the growing green economy for the poorest residents. Battle lines were drawn: The Chamber of Commerce and their front group, OakPAC versus the Dellums coalition. The race was odd. Dellums campaigned sparingly. Nancy felt (understandably) abandoned by progressives. Ignacio tried to soften his image with a bizarre mailer showing him cuddling up to an enormous (and very uncomfortable) golden retriever. Still, Dellums received a couple hundred votes over the 50% needed to avoid a runoff. It was a sharp repudiation of big business. The Chronicle pretended it didn’t happen, but 65% of Oakland voted for a serious change. Dellums was the Mayor-elect with a mandate, but he had one big problem: He can’t count. There are eight seats on the Oakland City Council, and as it stands today, three votes are reliably progressive and the other five are reliably pro-developer. To win, you need four plus the mayor. Five votes = real progressive power. That’s where District Two comes in. Councilmember Pat Kernighan is one of the most reliable votes for Ignacio and developers. Half her campaign contributions come from big business. She is a classic “tinker around the edges” politician, who actually told a reporter last month that she had no idea what the root causes of violence in Oakland really are. When Kernighan won her seat in a 2005 special election, one of her eight opponents stood out: Anti-war activist and small businesswoman Aimee Allison. One of the only women ever to earn an honorable discharge as a conscientious objector, Allison earned a reputation in Oakland by counseling students about aggressive military recruitment and helping small business owners. In 2006 Allison ran again. Heavily outspent, attacked in secret leaflets over her racial background and excoriated by her opponents, Allison stunned observers when she pushed Kernighan to a runoff. A Green Party member, Aimee won almost 40% of District Two. The stage was set for a showdown this November. 1. Address the real causes of violence in Oakland, through programs like peacekeeping teams and services for parolees. 2. Fight for Oakland’s piece of the growing green economy. 3. Double funding for children and youth. Her campaign looks a lot like the Matt Gonzalez run: A hectic office full of young people and people of color. A fierce ground game. A struggle to overcome Kernighan’s misleading mail campaign, including a piece where she “came out” as progressive, co-opting Allison’s message on diversity and the war. Last week, the Oakland Tribune revealed that OakPAC sued and won the right to spend unlimited amounts on any candidate they choose. It was a shocking challenge to clean election laws, but more shocking is the amount: They pledged $116.000 to beat Aimee Allison. For those counting at home, $116,000 is more than what the actual candidates will spend themselves on the entire race. The OakPAC power grab underlines the importance of this race: It is literally people vs. profit, and profit is starting to panic. San Francisco progressives don’t pay a lot of attention to Oakland, but business sure does. Why? Oakland is one vote shy of enacting some of the nation’s boldest ideas as law. For any of us who have dreamed of the day progressive ideas would actually have the votes to move forward, it’s here. The classic underdog could help take back City Hall for everyone. The San Francisco Board of Supervisors won’t swing progressive this year, but our friends across the Bay could show us how it’s done. Come out this Saturday and knock on doors. Give until it hurts (even if you don’t have $116,000 to spend). For anyone who believes change is possible, Aimee Allison matters, deeply. Help us count to five in Oakland. Ben Wyskida is a writer and activist living in San Francisco. He is a volunteer with the Aimee Allison campaign, obviously, Go to www.aimeeallison.org.